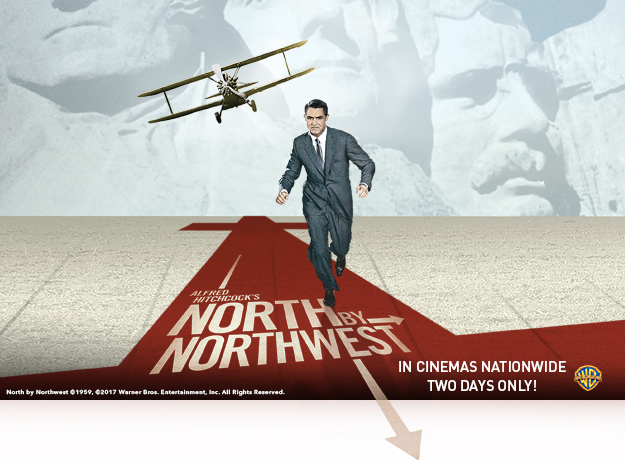 Win Tickets to see “North by Northwest” on the Big Screen! in Select Cinemas Nationwide Sunday April 2 & Wednesday April 5! 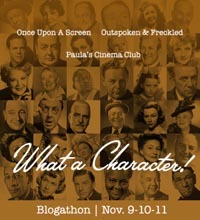 CMH is thrilled to announce the 4th of our 14 movie ticket giveaways this year, courtesy of Fathom Events! 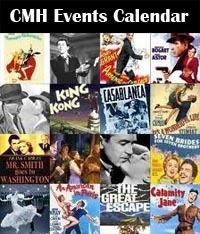 That said, we’ll be giving away EIGHT PAIRS of tickets to see “TCM Big Screen Classics: North by Northwest” – the classic Hitch film starring Cary Grant, Eva Marie Saint and James Mason (incidentally one of my all-time favorite Hitchcock films) — the way it was meant to be seen — on the Big Screen! In order to qualify to win a pair of movie tickets via this contest, you must complete the below entry task by Saturday, March 18 at 6 PM EST. We will announce the winner(s) on Twitter on Sunday, March 19, between 6PM EST and 7PM EST. If a winner(s) does not have a Twitter account, we will announce that winner(s) via this blog in the comment section below. 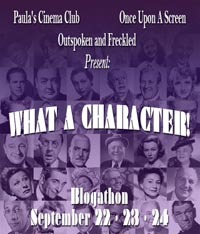 About the film: This Alfred Hitchcock cross-country adventure offers non-stop thrills and a bit of romance. Cary Grant stars as Roger O. Thornhill, a man wrongly accused of murder, who hops on to a train … and into the lap of Eve Kendall (Eva Marie Saint). All the while, he’s pursued by the sinister Philip Vandamm (James Mason), who is convinced that Thornhill is a spy. What do you love most about “North by Northwest”? And, if you haven’t seen it yet, why do you want to see it on the Big Screen? NOTE 2: Due to an unprecedented amount of spam that we get, please give me at least 24 hours to manually find and approve your entry comment. Hitchcock is my favorite director. I just love the way Hitchcock tells a story. In addition to being one of my favorite Hitchcocks, it’s one of my favorite adventure films. Additionally, I’m introducing a friend to classic films, and for him to see this on the big screen for the first time would be such a bonus! Oh this is going to be a good one to share with a ‘newbie’ 🙂 Thanks for entering and Good Luck! I’m converting him to a classic film fan! 1) Cary Grant! 2)Love the Mt. Rushmore scene 3) The house! I love the action scene in North by Northwest that takes place on Mount Rushmore. Very exciting. I also love Cary Grant. One of my favorite actors. One of my all time favorite Hitch films 🙂 Thanks for entering and Good Luck! I love the chemistry between Cary Grant and Eva Saint Marie! I love North by Northwest because it’s directed by Hitchcock, so has intrigue and great cinematography(like his technique to reflect the characters in a mirror-like object (trying to avoid a spoiler) resulting in them get caught). Also the acting is great, and it is classy in that things are implied(to get past the censors) that don’t need to be spelled out. North by Northwest is classic Hitchcock, deception, mistaken identity, MacGuffin, innocent man becomes hero, blonde heroine, suspense, mystery, Bernard Herrmann, and Saul Bass! Some of his most iconic scenes come from this movie, such as the crop duster, Mount Rushmore, and its final shot of the train entering a tunnel. Alfred Hitchcock is one of my sons favorite directors and he has yet to see North by Northwest. I am looking forward to introducing him to this classic on the big screen. Thank you. I have never seen this film, just clips, but have always heard about it. And anything by Hitchcock always leaves you a little unnerved….which can be a good thing sometime, since you can remind yourself it’s all just on film, right? ….Well except for that shower scene!!!! You know the one. Yikes!! Just watched the DVD and WOW what a great movie even on the small screen!! All the poster’s comments came to life now; R.O.T., $2,250, the phone booths, the music, the tunnel. And though I knew the Rushmore scene was a ‘fake’, my palms still got sweaty!!! Yes, Hitch knew how to set up scenes leading you to the emotions he wanted you to feel. A master at subconscious effects. Naturally, I watched all the director’s commentary which happened to be by Ernest Lehman, the screenwriter, and a behind-the-scenes short by Eva Marie Saint. Lot of good tidbits there. One very interesting was that it was against the law to film at the United Nations even outside. But they found a way around it. Eva tells a lot about her wardrobe and style that was personalized by Hitchcock. Besides the obvious amusing scenes, I also found it very amusing that Cary/Roger always had plenty of cash to throw around over a period of days without it getting stolen or ever having to replenish. And did anyone notice that the policeman was using a telephone in the unit as they were transporting Cary/Roger from the auction to the airport rather than the handheld mic? So I guess those were around in the early 50’s. Loved all the classic cars and fashions. I grew up with them! Definitely can see why it is a Classic and a favorite. Now I’m adding it to my list. Would love to know what the TCM host reveals at the end. What do you love most about “North by Northwest”? Cary Grant, James Mason are among my movie actor heroes. Also, it is a rollicking adventure. And, if you haven’t seen it yet, why do you want to see it on the Big Screen? 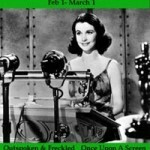 I have only seen it on the small screen, so I am quite excited to see it as originally intended, on the silver screen. Wonderful performances all the way around 🙂 Thanks for entering and Good Luck! I barely remember the last Hitchcock movie that I saw because I must have been a teenager. Getting a chance to see this classic film on the big screen is a treat. My son is interested in becoming a director and has never seen this film. What a treat it will be, for the both of us. I love this movie and have watched it on TV dozens of time. Cary Grant, James Mason, and Eva Marie Saint were perfectly cast in this film. The beautiful dresses for EMS and the perfectly coifed Grant would be worth watching even if they were one still shot. I have become interested in special effects and this one has some great ones at Mount Rushmore. Films are always better if seen the way they were meant to be seen–on the big screen. I’ve always considered North by Northwest to be among Alfred Hitchcock’s finest films. Even more exciting and daring than To Catch A Thief or Notorious, I would rank it next to Suspicion as his best collaboration with Cary Grant. The cinematography and score are flawless too of course, and I would even go as far as to say that the performance given by the supporting cast is memorable and magnificent. James Mason in particular has always stuck out in my mind as one of Hitchcock’s classiest villains. Despite how much I love everything else about the film, I think my favorite part of North by Northwest by far is Eva Marie Saint. Her portrayal of Eve Kendall was so ahead of its time, and I admire her fierce independence so much every time I watch. I wrote Miss Saint a fan letter last year and was honored to receive her autograph in return, and since then I’ve really wanted to see this film again. 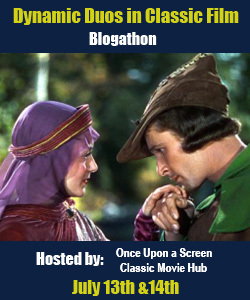 I think this would be the perfect opportunity, especially because it would be my first time seeing it on the big screen! Congratulations, you are our winners! I just emailed you. If you don’t receive the email, please let me know. North by Northwest is my favorite film (shortly ahead of White Christmas) most likely because it presents such an amazing recipe. 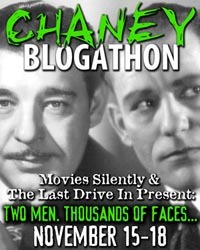 Directed by Hitchcock and starring Cary Grant, it has a terrific mix of action, adventure, intrigue, and humor. The cinematography is fantastic — no matter how ridiculous the concept of a man being chased by a crop duster might be, they pulled it off to become one of the iconic moments in cinema! — and the movie grabs your interest from the first notes of the marvelous ‎Bernard Herrmann score during the opening credits. And I have not yet even mentioned the rest of the wonderful cast. 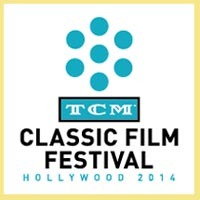 Of all the TCM Big Screen Classics I’ve been to or intend to see, this is by far the one I most look forward to. I am a huge fan of Cary Grant. I love all of his movies but this one in particular is a favorite of mine because I used to watch it with my grandma who is the one who introduced me to classic movies when I was very young and gave me a appreciation for these wonderful films. I think I like all the great shots of late 1950s Chicago. Since I live in the Windy City, it’s fun to see things on screen that don’t exist anymore like the LaSalle Street Station. Places that still exist, but are unrecognizable to modern viewers like Midway airport. And there’s a great shot up Michigan Ave. from Prudential Plaza. The Prudential Building, at 40 stories, was the tallest building in Chicago then!? I love the story with all its twists and turns. I have never seen North by Northwest and would love to because it combines suspense with a bit of romance. Keeps the audience on its toes which is why I want to see it on the big screen especially an Alfred Hitchbook film. I wouldn’t say North by Northwest is Hitchcock’s best, but it’s one of my favorites. It’s less serious than Vertigo or Psycho and is more a fun adventure film that sort of pioneered the style of the James Bond series a few years later. North by Northwest is my favorite Hitchcock film. I love Grant’s and Saint’s chemistry, the witty dialogue, the suspense-filled tale of a man in the wrong place at the wrong time. Really, there’s nothing I don’t like about this film, and I’ve seen it so many times I’ve lost count. Can’t wait to see it on the big screen. Truly an experience to remember. Sorry for the half-italicized comment! HTML tags went wrong on me. North by Northwest is my favorite Hitchcock classic because it has romance, intrigue, action, suspense, and of course, Cary Grant in Color. And what guy doesn’t want to Cary Grant? Style, class, etc. The soundtrack is great, the set locations are superb. I never saw it on the big screen but whenever it’s on TCM, I make sure to see it. To see it on the big screen? Priceless. One of the great Hitchcock movies. An ordinary man thrust into situation he’d never dream of due to answering a phone call. It’s brilliant. The set locations, the entire cast, the acting, the suspense, the romance and Cary Grant in color. To see on the big Screen? Priceless. Cary Grant gives a terrific performance. Archibald Leech is my favorite actor. Never seen it. Would love to see Cary Grant on the big screen. North By Northwest has been on my Top Ten list since first viewing it as a child. The combination of intrigue, comedy and romance under Hitchcock’s direction is simply brilliant. This film continues to excite even upon viewing for the fiftieth (plus) time. Cary Grant is at his absolute best, playing the charming, somewhat bumbling lead. Eva Marie Saint is both enigmatic and endearing. James Mason is simply excellent in his deviousness. Herrmann’s score sets the right tone from the get go, as it always does. This film is pure entertainment from start to finish and there are few that can surpass its overall allure for me. I haven’t seen North by Northwest yet, but LOVE Alfred Hitchcock movies (Psycho is an all time favorite of mine). And what other way to see them than other on the big screen? I love the soundtrack by Bernard Hermann, especially during the scene in the train dining car. One of my all time favorites. I love the casual depiction of life in the late 1950’s, the no need for security at all times, the hope for a better world the UN seemed to promise and the beauty of the train ride. Eva Marie Saint is gorgeous. Had the opportunity to see her in person at the 1st TCM Cruise with Robert O.
Congratulations, you are one of our winners! I just emailed you. If you don’t receive the email, please let me know. I love when Martin Landau picks up the gun, points and shoots at James Mason – who then knocks Landau on his bottom, for both the scare and for breaking the truth about Eva Marie Saint being a double agent! I have never seen North by Northwest. I hear it’s a classic and definitely worth the watch. I would love for my first time experience watching it to be on the big screen! I love this movie! 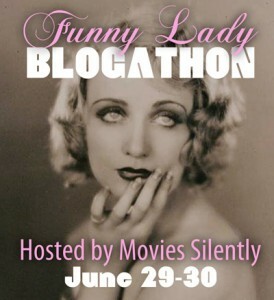 It’s got it all-romance, suspense, great cinematography…and Cary Grant! Who could ask for more? One of Hitchcock’s best. It would be amazing to see North By Northwest on the the big screen and see the crop dusting scene and the Rushmore scene, etc! Wow! It is my favorite Hitchcock movie! Cary Grant is my all time favorite actor! I have seen this movie at least 100 times..I just love it so much. 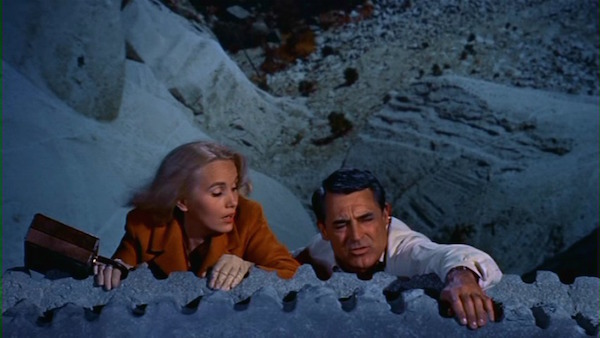 Cary Grant n Eva Marie Saint are great together. I love all the locations it was shot in. The opening credits are very cool! It’s met to be scene on a big screen. I have never seen on the big screen but would love to!! I love Cary Grant and Hitch! This movie is one of my favs because of the train scenes. The dining car and the cabin scene. Grant is male perfection. I love Cary Grant’s performance and Bernard Herrmann’s score. I’d love to see this on the big screen! I find NxNW to be one of those suspense movies where raw sexuality is woven into many of the key players. The dialog is so well crafted that its like two movies in one: a thriller and a mild erotica. Hi Bret. Can’t seem to find your tweet. Could you please confirm here that you tweeted or let me know if you don’t have a twitter by commenting here. Thanks! This may be an unusual answer, but the thing I love most about NXNW is the row of telephone booths. They remind me of the ones inside the dorms at San Francisco State. I wonder if those are still there. It’s been 17 years since I saw them there. Truly a thing of beauty. I’ve never seen the movie in full. But how I love Cary Grant… Recently TCM has been my closest friend, kind of in a low spot in life and classic movies are my happy place. To see it on the big screen as my grandparents once saw it would be an amazing time and I’d get to share my happy place with a friend. 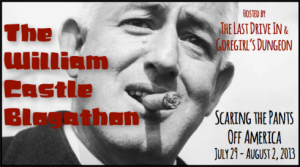 Cary Grant in an unending race for his life, and Hitchcock’s most unabashedly entertaining film. I love the whole movie. I especially like the mountain scene. Hitch does some amazing shots in this movie. Answer: Hitchcock. Simple, but I can’t gloss over the performances especially the Fantastic Martin Landau. He has a unique role in film, especially at this time, and pulls it off masterfully. The crop duster sequence is outstanding! I’ve always wanted to see “North By Northwest” but I didn’t want to rent or buy a DVD just to see it on my TV. When I heard it was coming to my local theatre I was THRILLED! That’s the way all good movies should be seen- on the big screen, not on a TV, computer, or hand-held device. I do not have a twitter account, so I am posting here to enter but cannot tweet the message. You have to love the dialouge! i.e…. Roger: That’s a good omen, don’t you think? The chemistry between Eva Marie Saint and Cary Grant! Basically, North By Northwest is my favorite Hitchcock film and I’ve never seen it on the big screen. I love that mistaken identity starts the whole thing. I love the witty dialogue and scenery. I’ve never seen North by Northwest before, but I’ve been told as a Hitchcock fan that I need to see it. I think the Mount Rushmore scene is something that needs to be experienced on the big screen, not my TV. The cinematography and acting are absolutely incredible! I’ve not watched it in years and I’d love to revisit it in a theatre. Hi, can’t seem to find your tweet. Could you please confirm that you tweeted, or let me know here if you don’t have a twitter account. Thanks! Among the many things that I love about this film is how funny it is. You don’t expect to have laughs and such a tense, well constructed thriller! North by Northwest is my favorite Alfred Hitchcock film that I’ve seen so far! What do I like most about it? That’s hard to pinpoint: the mystery? Cary Grant? James Mason? Eva Marie Saint? the “twist” near the end? the last shot with the train and its imagery? I love it all! North By Northwest is my favorite movie. It is funny and thrilling, and also subtle. 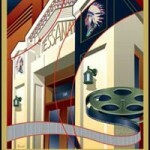 (I love, for instance, that the song playing in the hotel lobby, as Roger Thornhill heads for his ill-fated meeting is “It’s a Most Unusual Day.”) It was the first movie I owned in Betamax format, in VHS format, on DVD, on Blueray. I think, even before I had a home video device, it was the first movie we rented — along with a player — on those old, superbig laser discs! North by Northwest is my favorite “fun” Hitchcock film. It’s not as serious as Vertigo or Psycho and it feels like Hitchcock was taking a break from being the “psychological guy” to make a fun, proto-Bond adventure. Plus, the cast is fantastic. I’ve been wanting to watch this film forever. However, I’ve known it’s going to be playing in theaters so I’ve waited this whole time. I wanna make it a special experience. I wanna feel the magic when that crop duster blows over Cary Grant’s head. I wanna experience that in a theater. Hi Collin, can’t seem to find your tweet. Could you please confirm that you tweeted, or let me know here if you don’t have a twitter account. Thanks! NbNW is one of my favorite films. Witty dialogue: “What can a man do in a hotel room in 15 minutes?” Cornfield menace. Climactic chase down Mr. Rushmore monument. I could go on. MUST be seen on a big screen. It’s such a wonderful film, isn’t it? On so many levels. One of my favorite Hitch films 🙂 Thanks so much for entering and Good Luck! My favorite part is how romantic and seductive the train scenes are it makes me want to ride on a sleeper train! This was my grandmother’s favorite movie and I remember watching it with her. 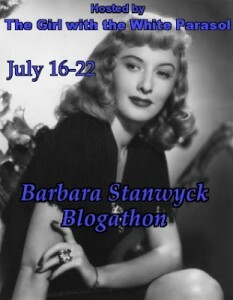 She just loved Cary Grant, as do I! Oh that’s wonderful that you have such fond memories with your grandmother 🙂 So many of us classic movie fans learned about these incredible movies from our parents and grandparents. Thanks so much for entering and Good Luck! I haven’t seen it yet, but every Classic Movie should be seen on the big screen the way it was intended to be seen. I’ve seen a few on the big screen (recently Sound of Music and The King and I) through Fathom Event and not only did I have an enjoyable experience, but it was nice to be among fellow fans. We got the opportunity to talk before and after the movie, something we usually don’t experience with going to the movies. One of many great Hitchcock films that has mystery, intrigue and, of course, a great Hitchcock blonde. Who could ask for anything more. I have seen this movie many times, but never on the Big Screen. I cannot wait. “North by Northwest” for me spotlights all of the genius of Alfred Hitchcock. Impeccable casting with sparkling dialogue, tension and intrigue. R.O.T. to the core! The crop duster scene and Mount Rushmore are two of my favorites, but really, what’s not to love about this film? Cary Grant – need I say more? Hitchcock is incredible with his suspend movies. 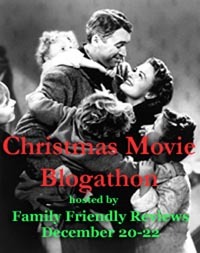 I love this particularly movie because it has a mix of comedy and thrill, the scenes with his mother, the scenes at the Mount Rushmore National Memorial, and the ending of the movie at the train that is tide to it when Cary Grants wants to save her with his hands. My husband and I went to Rushmore, and I felt that is was a dream being there and thought about the movie. Grant is my favor actor. Thanks for showing in the theater. 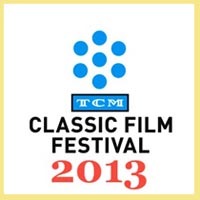 I am planning to invite some friends because I always tell them that TCM is a channel that I will never change. What I love most about North by Northwest is the cinematography in VistaVision by Robert Burks since I love movies filmed in VistaVision and to see the great Jessie Royce Landis act in the movie. It’s always a delight to see Jessie in any film. Love Hitchcock! I’ve been a fan ever since the 90s screening of rear window! Always fun to see his films in the theater! Hope I win!